Basseterre, St. Kitts – Hon. Mark Brantley, Minister of Foreign Affairs and Aviation is today hosting the Caribbean Development Roundtable addressing The Debt Overhang: balancing adjustment with sustainable development in the Caribbean. This event is being hosted at the St. Kitts Marriott Resort. The main objective of the Roundtable is to develop a strategy for addressing the vulnerabilities of Caribbean Small Island Developing States (SIDS), through identification of integrated policies for building resilience. It is expected that this will facilitate a cross-fertilisation of ideas that will support the development of a strategic vision designed to bolster the resilience of Caribbean SIDS. At the Opening Ceremony chaired by Ms. Kaye Bass, Permanent Secretary in the Ministry of Foreign Affairs and Aviation, Hon. Mark Brantley gave the Welcome Address. 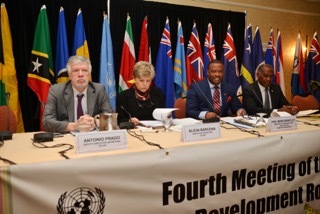 He expressed satisfaction with the topic of discussion which he intimated is particularly timely given the high debt profile of a number of Caribbean countries. This he further opined constrains the ability of governments to provide a full suite of social services for its citizens. The Executive Secretary of the Economic Commission of Latin America and the Caribbean (ECLAC), Ms. Alicia Bárcena, presented ECLAC’s proposal on debt for climate change adaptation swaps. 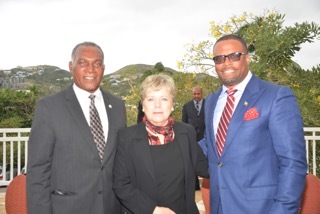 The strategy was put forward for growth and economic transformation of Caribbean economies. The proposal promotes consideration of a strategy to address the debt overhang of Caribbean countries while encouraging investment in climate adaptation and structural transformation that can contribute to changing the economic fortunes of the sub-region. Her presentation was set out in such a way, so as to answer key questions with regard to the high debt burden of many Caribbean economies: what is the current situation? How did the sub-region get here? What is the challenge moving forward? What in ECLAC’s view are possible opportunities for or solutions to remedying the situation? How do we proceed? In so doing we will be able to deconstruct the various elements of the ECLAC proposal and also identify the composition of the debt and the myriad related economic challenges facing the sub-region. This provided a sound basis for the town hall discussion and the two panel presentations that will follow as the Roundtable continues. Acting Prime Minister of the Federation Hon. Vance Amory, in giving the Caribbean’s Response looked at issues facing Caribbean SIDS which included our reliance on tourism and financial services and the migration of our Human Resource. 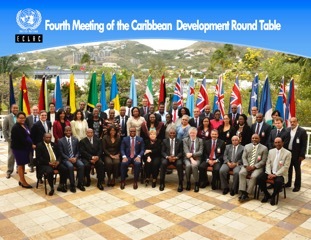 He further spoke of the importance of Caribbean countries to be able to provide the opportunities for economic growth, employment and the provision of Healthcare and Social Services to meet the demands of our people and the need for cooperation and collaboration to design and implement common policies. The Roundtable ends today and will be followed by a meeting of the Caribbean Development Cooperation Committee on Friday 22nd April.